Today I battled the Mistral, a wind that blows through the Rhone river valley. It was tough! Its strongest in the Spring, and supposedly drives people crazy. I wound up in Avignon today and had no idea that the city is completely enclosed in a wall. I love being surprised like this, rather than planning something out from a guidebook. 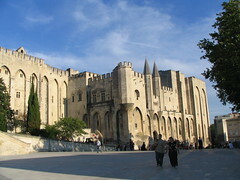 Avignon is also known as the city of the Popes. 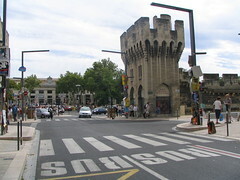 Avignon was also having their Off Festival, which is a one month long festival of shows and comedy acts. I saw two – the first was ‘La blonde, la belle, et la salope’ (the blonde, the beautiful, and the whore) and it was really difficult to understand. They talked so fast! Then I saw Charli Encor, ‘To fou or not to fou,’ and it was really funny. I could understand him much better than the 3 women. 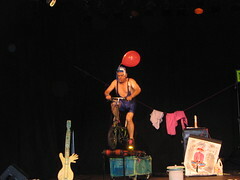 He finished the act by getting on rollers and popping a balloon on his head. « The Tour inspired me!